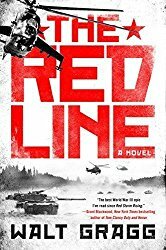 A story with its beginnings pulled from the headlines of today and realistic events that could happen, The Red Line gives a scary look at a what if of the near future. First of all, I liked the book overall. The pacing was good, and everything was well developed. However, for my own personal taste there was almost too much detail. I know the author intends to give a comprehensive covering of all the aspects of the what if scenario but I personally didn’t need to know the shot by shot coverage. That being said, it was done well and you could feel the tension in each scene. There is definite realism in the story. I like that we don’t get all sunshine and roses throughout the book. We do get realities of war even when it hurts, and that hurt is to the plus of the author’s talent. You feel the losses that take place. I would recommend this book to anyone that really gets into war stories and likes to feel the action. I recommend this book to anyone who really gets into a good war story with real events occurring.